A fictional story of a boy (Ocholi) who left his village (Adumu), to go live at his uncle’s house in the city to further his education. As a boy in the village, Ocholi had made a solemn oath to himself that he will never disobey the “grand-gods” of Adumu village because his grandfather had told him the story of how he had lost his four children in four market weeks after he disobeyed them. Ocholi came to the city with the knowledge of the religion of his grand-gods even after he went to the primary school owned by the white missionaries that brought their religion to his village. As he was growing up in the city he discovered that people have enslaved themselves to religion. He found out the real truth behind the practice of a religion. He saw that the city had been dogmatize by religious fanatics unlike in his village where some people accepted the preaching of the white missionaries but still live in peace with the other people that accepted the white man’s religion. His foster family were all surprised as he came to the city from the village and became a champion. When they accosted him, he clearly told them that he practices faith beyond religion. He enlightened them on various religions, their dos and don’ts and he equally urged them to do research on these religions. From the story in the book, you will get information on the practice of various religions as Ocholi was explaining them to his foster family and friends. You will know what it takes to practice a religion. Ocholi was an epitome of love, forgiveness, truthfulness, and he have an irreproachable character. At first his foster family were all surprised at where he got his characters from but to their amazement again Ocholi notified them that he got to know how to show love to people from the traditional religion of the Adumu people which is; “worshipping the grand-gods,” of Adumu village. “Actually I have learnt to practice faith beyond religion. I discovered that I really needed to ‘Return Home Beyond The Slavery Of Religion’ for me to love and worship God my creator. I discovered that God is still creating people into all the religion. I discovered that religion is a thing of the mind and we should endeavour to get people attracted to our religion with our behaviours towards them,” Ocholi said to his foster family and they all agreed with him. “Do you agree with him too?” Get a copy of the book and read to see more reason why you should be-for or against Ocholi’s thought. humnnnn! what a writing. Indeed religion has been responsibly for a lot of slavery to a dogma that prosecute. 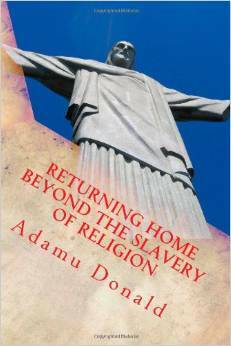 I recommend this book to every one because it is high time we return home beyond the slavery of religion to worship God our maker. The author is a man of deep and sincere conviction and it shows in his writing. I am happy to call him my friend. He has displayed a unique insight into the paths of religion and the harm rendered due to hate, mistrust, misinformation and falsehoods down through the ages. Let’s hope this book can be the beginning of a rebirth of understanding and the acceptance of each other for all of God’s peoples. Religion still remains one of the pervasive moral poison derogating the society today, it is important to note that every human has a right to enjoy respect for liberty and security as to his or her choice of religion, the sentiment attached to religion nowadays fall short of the bench mark of the meaning of religion, it is axiomatic that, without efficient guarantee of the liberty and security of persons right to choose their religion, they becomes vulnerable and often illusory to the religion, A society that records high standard of religious influence is invariably Brutish, Suppressive and Repressive, and the peoples hope and confidence as to the choice of religion is dampened,thereby creating a pungent feeling of Apathy, Disenchantment and Distrust in the religion. Every religion should be able to tolerate other religions. It is unimaginable that everyone should belong to one religion. I hope this work achieve the its original purpose for which to the best of my knowledge was conceived Great work, congrat and God’s grace. it on my blog (pirater un compte facebook). I simply want to tell you that I am just newbie to blogging and site-building and honestly loved your website. Almost certainly I’m going to bookmark your website . You certainly have tremendous articles and reviews. With thanks for sharing your web-site. posts. Keep up the great work! You understand, a lot of persons are hunting round for this info, you could help them greatly. Hi! I was just wondering what theme this site was using on this page. won’t miss it), post on my Facebook page (castle clash cheats) or send me an email (my email is EmiliaPhelps [at] gmail [dot] com).